Writing a perfect Blog Post is not a easy task. Its not a day's work. It takes some planning, skimming, brainstorming sessions. It becomes a draft. Furthermore, it needs some tinkering and painting works that leads to publishing it as a post. As like that, attracting your readers is also a tough one. You may think it as a piece of cake but it's not. You have to work on your presentation levels as well as your knowledge about the topic. Lets say you have written 10 blog posts so far and your Google Analytics tool shows your returning visitors rate is much lower than new unique visits. That indirectly means you have not satisfied your readers. Your readers are not attracted to your posts. This post will help you to get noticed by your readers. Here are 7 ways to attract your readers and to increase your returning visitors rate of your Google Analytics tool. People love hearing about your personal experiences with your post subject. No matter what your niche you write about, try adding some of your real time examples that you cross over daily. For example:; If you write about Tools that manage your Tweets, write something that you have used for your account and found useful and your views about it. 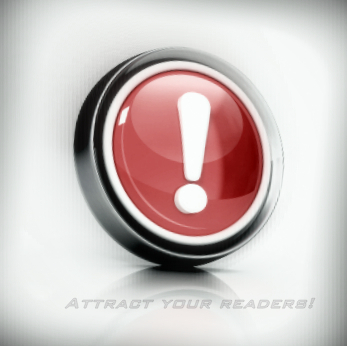 This will not only attract your readers but also increase your content. Readers prefer your views about a particular topic. Give them your views through your post. Explaining the things with statistic numbers will attract your readers. The numbers need not to be accurate but it has to be approximate . Use some Quotes while writing a post. You can start with a Quote if not you can end with a quote. For example:; When writing a Blogging Tips post, try adding some motivational quotes at the start. It will make the readers excited to read next below. Infographics has been the latest trend these years. With the growth of Pinterest it has gone quite effective in Blogging. A picuture says everything that you want to write in a post. Add images with statistics and informations in your blog post. Mostly people will find useful these pictures rather reading full posts. Surprisingly, if an image is not good or related to your blog post, people will neglect reading the content. Try including infographic images often in your posts. Videos play a vital role as the same as Infographics. For example:; If you're running a tutorial blog, your blog post is about "How to crack a Wi-Fi?". You may write every instructions line by line. Some may read it fully and some may understand it fully. When they try with only the instructions, it won't be that easy. If you add a video for that tutorial I bet they will watch and learn. It is an easy way to attract your readers to your blog. Imagination is a very big tool to attract your readers. We all imagine whatever it is worst or the best. Imagination is a daily routine of we humans. Making people imagine while reading your posts will attract many readers. Use words like "Imagine the situation where ...", "Lets say ..." etc.. You have to be clear at the end when making your readers imagine the worst, that you have something to come up with a solution. Your blog post should produce a kind of impression to your readers once they see it. All your blogging tools provide the HTML Editors like WYSIWYG etc. You can make use of the rich HTML tags for your post to make them shine. Make use of the tags like blokquote, heading tags h2,h3,h4,h5 etc., bold tag <b>, italics <i> etc in your post. It will create an alignment to your post and also will attract your readers. Most of all, running an interactive session will always be a thing for the readers. When a reader wants to comment on your blog, reply with them and make it an interactive session. For example:; Ask questions at the end of the post or it is even better to ask them share their views on the topic. Let them know you are concerned on their views. This will never hurt you or your readers. If they like your post, they will comment and this is a chance to know your readers ideas and point of view. Always finish your post with a Conclusion or give a proper ending. P.S: Another thing that is not listed in the above 7 ways to attract your readers is concern your readers and never disappoint them. Satisfaction comes when you deliver a good post to your readers and they feel the same about it. Good list. I have also seen great success organising promotions that drive traffic to the blog. For example: asking a question about something you have mentioned on your last article or a video. This not only drives traffic, but makes people read (or watch) actively, and thus they are more likely to absorb the message.